Best Electric Fuel Pump for Carb Review: Top-5 in April 2019! A fuel pump is usually found in most vehicles today. There are two types of fuel pumps, the mechanical and the EFI (Electronic fuel injection). Carbureted engines require a certain level of pressure so that the flow of fuel is constant and in times of emergency, fast. Mechanical fuel pumps are usually found outside the fuel tank, while EFI units are always located inside the tank. Let’s take a look at the top-rated electric fuel pumps for carbureted engines. This is a classic Black pump that provides 140 GPH free flow and 120 GPH at 9 psi. The maximum pressure delivered is 14 psi. This is a street and strip performance model. This is a Gasoline and Methanol model that comes with a tumble polished billet design and the lower housing casting is designed for enhanced fuel flow. The body is painted with the Black logo and this model fits all alcohol or methanol fuel systems. This model is not recommended for use with EFI. This is a classic powerful fuel pump that provides constant pressure for heavy duty applications. This is a classic Blue pump that provides 110 GPH free flow and 88 GPH at 9 psi. The maximum pressure delivered is 14 psi. This is a street and strip performance model. This is a gasoline model that comes with a tumble polished billet design and the lower housing casting is designed for enhanced fuel flow. The body is painted with the Blue logo and this model is NOT to be used with alcohol or methanol fuels. This is a blue model and is used in many carbureted applications for gasoline only. 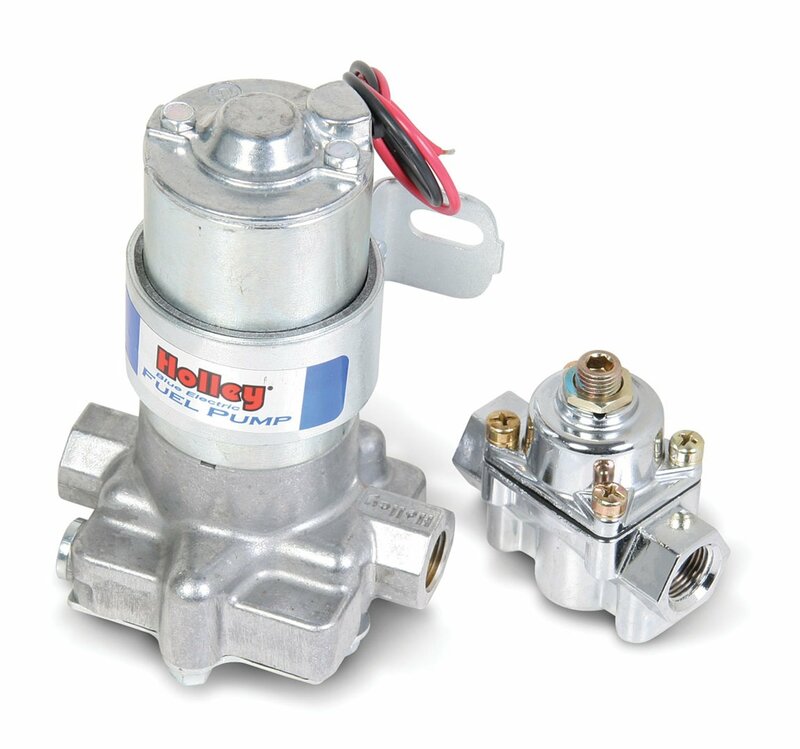 The Holley Mighty Mite™ electric fuel pump works with a lot of different applications and is also capable of working with gas, diesel, blended alcohol and E85! This is a 4-7 psi system that pumps up to 32 GPH and will work well with 400HP naturally aspirated performance. The pump itself only produces 65db of sound, so its quite quiet. A multipurpose low flow pump for many applications. This is a classic Red pump that provides 97 GPH free flow and 71 GPH at 4 psi. The maximum pressure delivered is 7 psi. This is a street and strip performance model. This is a gasoline model that comes with a tumble polished billet design and the lower housing casting is designed for enhanced fuel flow. The body is painted with the Red logo and this model is NOT to be used with alcohol or methanol fuels. This model is not designed to work with EFI systems. A very basic pump model for stock performance replacement. The difference between this model and the 802 is that this model comes with a return line and works with a wider variety of carburetors. This is a gasoline model that comes with a tumble polished billet design and the lower housing casting is designed for enhanced fuel flow. The body is painted with the, Blue logo and this model is NOT to be used with alcohol or methanol fuels. This is an advanced blue model and is used in more carbureted applications, and has a return line, for gasoline applications only. How To Pick A Fuel Pump For Carb? While pressure is key to the success of an engine’s performance, too much pressure will create a rich and rough ride, while under pressure will lead to misfires and a stall. That is why all modern vehicles using EFI connect the EFI to the vehicles computer system, or ECU (Electronic computer unit). The advantages of an electric fuel pump are how it reduces fuel consumption through monitoring the flow and use of the fuel in line with the engine and the whole motor tune. Modern vehicles come with a “tune” that means they are programmed to perform within certain parameters. One of these parameters is fuel consumption that is regulated together with the other engine functions. Through proper regulation and monitoring, modern engines are more fuel efficient than older models that do not have an ECU. 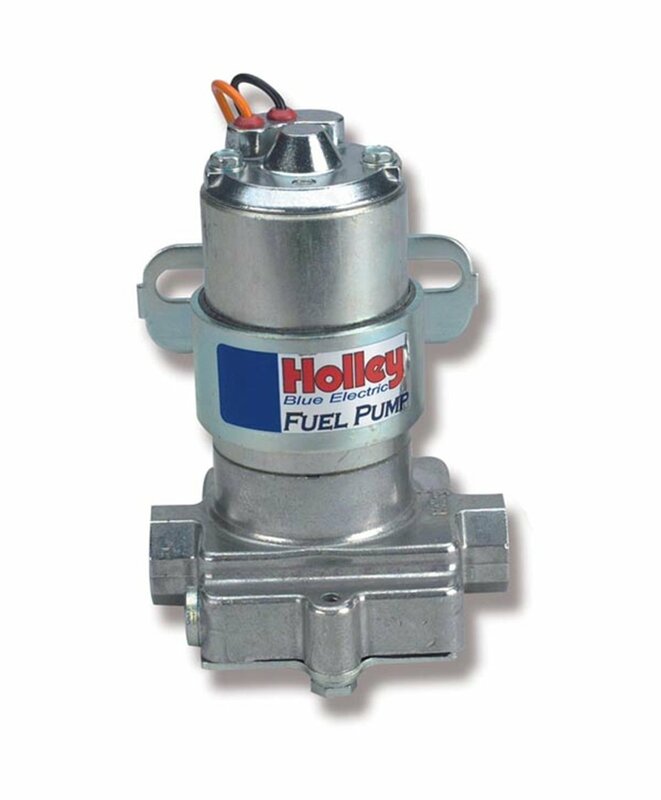 This article presents the top-rated Holley models, which are considered to be the leading fuel pumps in the aftermarket world. 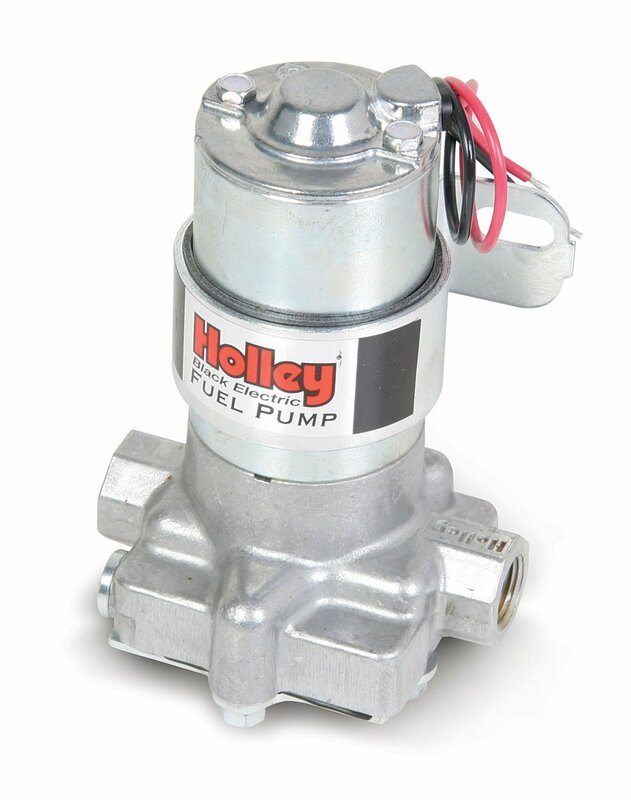 Apart from fuel pumps, Holley manufactures high performance carburetors, manifolds, superchargers, water pumps, and throttle body fuel units for stock and performance racing applications. The Holley site is split between Holley Engineering and MSD Engineering. The MSD site is a re=search and development site dedicated to improving systems; the Holley site is a mass production facility dedicated to producing top rated products. 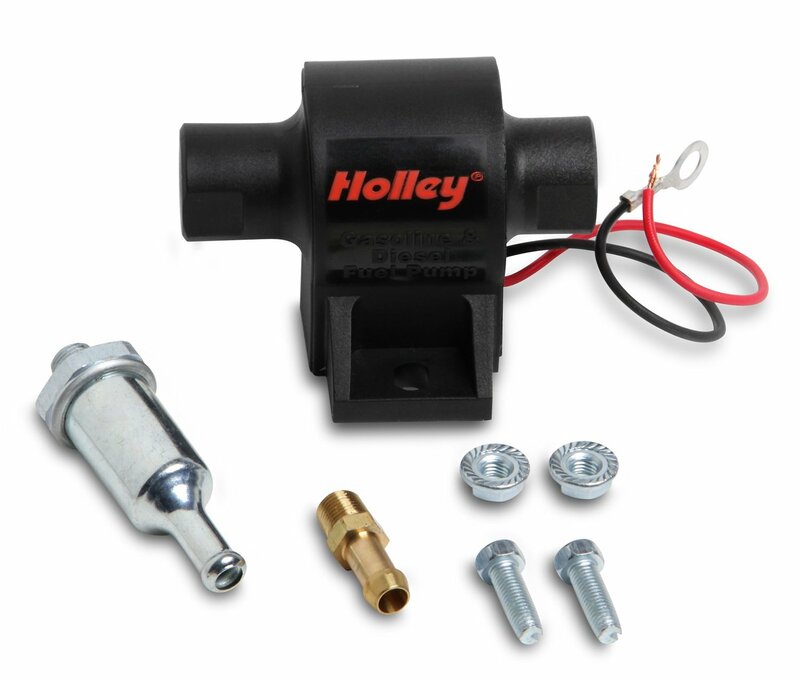 Each station in the production processed is manned (womanned) by a qualified engineer, as such, every Holley product is as close to perfection as you will get. 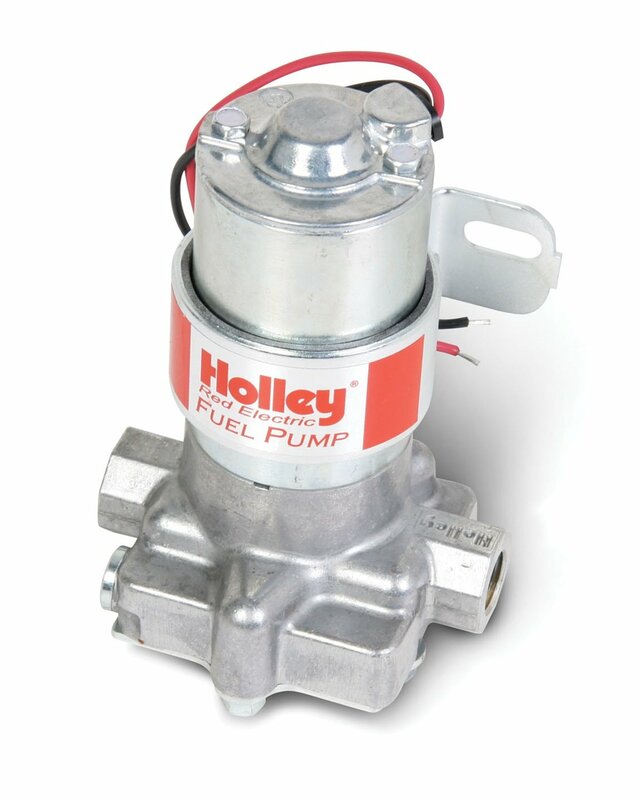 There are four types of Holley Pumps, the stock models and the performance models designated red (97GPH), blue (110GPH) and black (140GPH). The red models use a low flow rate that fits most stock and small performance upgrades; they don’t come with regulators. The blue and black models are for upgraded vehicles and provide a regulated high flow rate and higher psi level. Some of the models will work with mixed gasoline or diesel fuels, when choosing a pump, make sure you use it for the designated fuel types.